Bhartrhari (450-500 A.D.) holds a unique position in the history of both theory of grammar and general agamic philosophy. He is the best exponent of the 'sphota' theory and an outstanding writer on the philosophy of language. He has writeen a commentary on Mahabhasya of Patanjali of which a portion only is extant. Bhartrhari's verses are very popular even now - the Nitisataka on politics and ethics, Srngarasataka on passionate love and Vairagyasataka on enunciation. 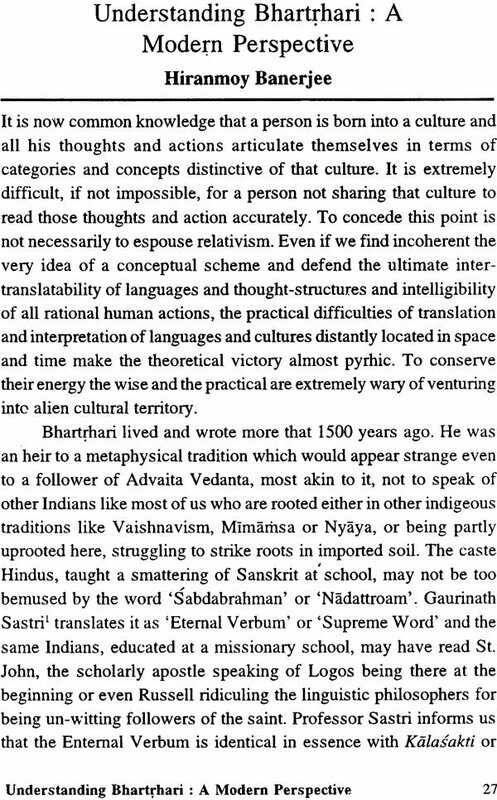 The most important thesis of Bhartrhari is about the relationship between the word and sentence. The meaning of the word is not arrived at by putting together the meanings of each word that constitutes it; not does the sentence as a whole have a meaning which can be explained by the real meaning of words. On the other hand, the meaning of sentence is indivisible, but may be explained by meanings of the real words that constitute it. Ludwig Wittgenstein born in Vienna, (1889-1951) is one of the most influential philosophers of the 20th Century; is best known mainly for his two treatises The Tractatus (1922) and the Philosophical Investigatios (1953). His Tractatus is besty explained as a synthesis of the theory of truth functions and the notion that language is a picture of reality. 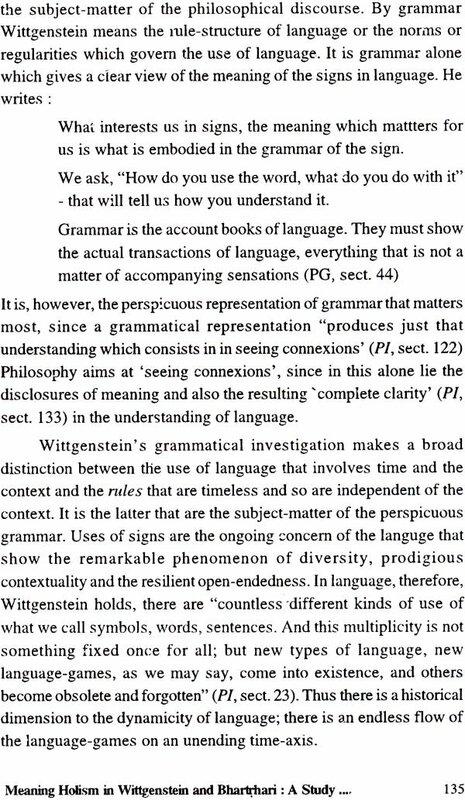 For wittgnstein also, the meaningful unit is not a word but a sentence. Though Bhartrhari of the East and Wittgenstein of the West say that there is a public component in the meaning of a word, they speak differently about the presence and the role of the mental in the meaningful use of a word. Both the perspectives, Wittgenstein's rational and Bhartrhari's intuitive, are verifiable. Similarly, Wittgenstein's perspective with its open endedness gives full scope to creativity and in Bhartrhari's perspective, creativity is within a pattern or framework and is meaningful. 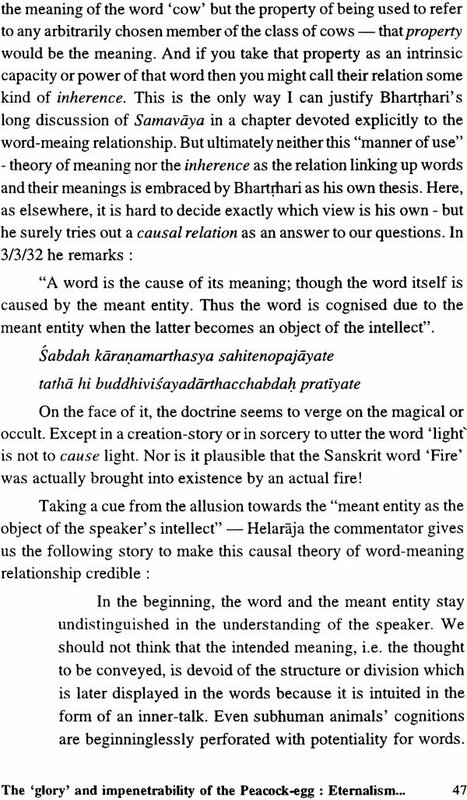 According to Bhartrhari's 'sphota' theory, what the speaker utters and the listener hears is the sentence as a whole, the Vakya-sphota; the division of the sentence into word and the words into phonemes have no absolute reality, but are abstracted from the sentence, for help in understanding the utterance. Those who know the language will speak and hear only complete, meaningful sentences, the Vakya-sphota. Thought and language are the expressions of one deep spiritual impulse to know and to communicate. Both Bhartrhari and Wittgenstein explain the psychic phenomena in the communication of the sentence sense with the example of the picture. But Bhartrhari does not draw the similarities of the sphota with picture in all details; for similarities for the Indian thinkers presuppose differences also. But Wittgenstein draws one to one correspondence between the logical picture and the spatial picture. Moreover, by juxtaposing two great masters, it is hoped that putting the two perspectives in dialogue would enable the readers to see the limitations and possibilities of each of them. This would pave the way to a meaningful use of the text, the perspective in our teaching and research. Sibajiban Bhattacharyya (b. March 1 1926), M.A. 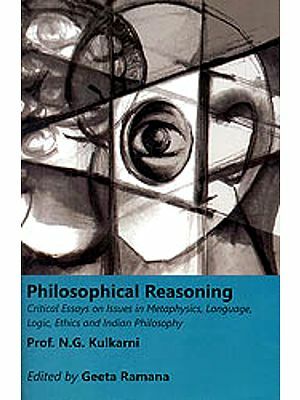 (Philosophy) from Calcutta University, started his career as Assistant Professor in Philosophy, Saugar University. Honoured with D.Litt (Honoris Causa) by Rabindra Bharati University. Dean of the Faculty of arts and Law, Burdwan University, (1971-73) and Visiting Fellow and Professor of many national as well as foreign universities. Authored six books and more than 100 research articles and edited five books. These proceedings of a seminar on Word and Sentence: Two Perspectives: Bhartrhari and Wittgenstein, held in Rabindra Bhavan in New Delhi from December 12 to 14, 1994, include all papers presented in the seminar, held under the joint sponsorship of the Sahitya Akademi, New Delhi and Indian Institute of Advanced studies, Shimla. Professer K.J. Shah planned and organized the seminar, but his sudden death prevented us from obtaining his help and guidance in the conduct of the seminar. In the seminar some speakers and all commentators on the papers made only oral presentations which were unfortunately not recorded. So these oral presentations could not be included in this volume. We are fortunate that Professor K.J. Shah circulated, before his death, a long letter stating his ideas on the subject of the seminar. We have included it in this volume. These papers written by scholars of repute will hopefully interest all readers and researchers of the subject. We dedicate this volume to the loving memory of Professor K.J. Shah. Word and Meaning : Identical? What has Bhartrhari got to say on Language?